Why do a day’s update when I can do a complete catch-up post, right? Ventura’s GSD got longer, but greener… and that’s a good kind of growth. Many of the tasks that were originally placed inside were too large and high level. During this week I split many of them into smaller parts and then completed those parts. 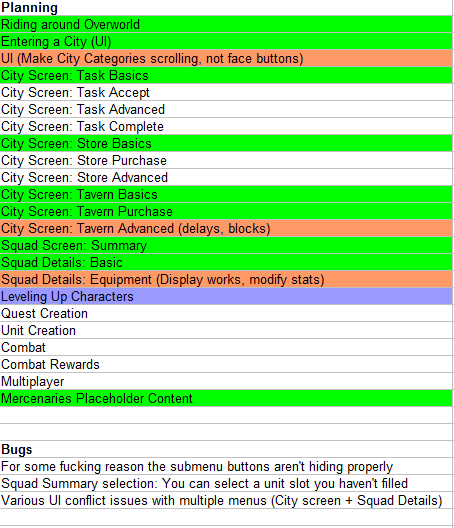 The first major feature completion is the lion’s share of the City UI. 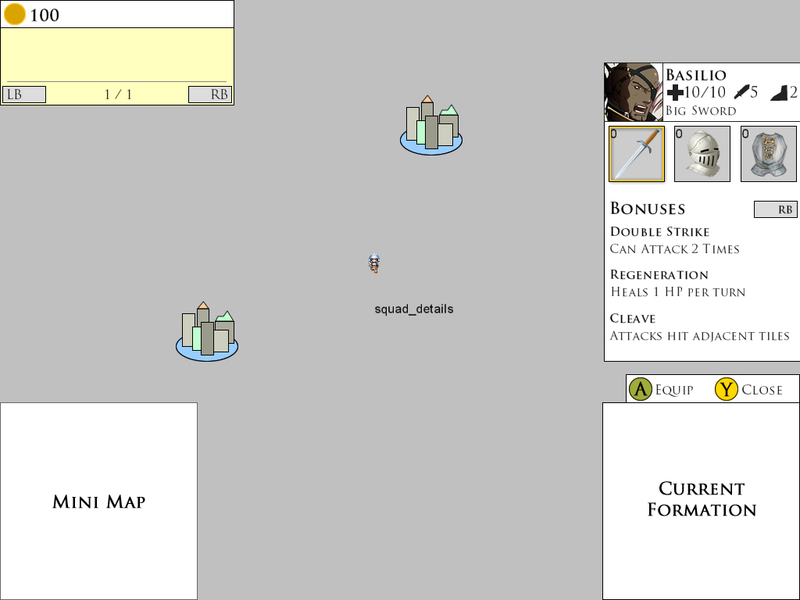 Ventura has 3 primary places that the player will interact with; the City, the Overworld, and Combat. The City is where players will obtain and accept Tasks, browse and hire Mercenaries, and purchase Equipment. 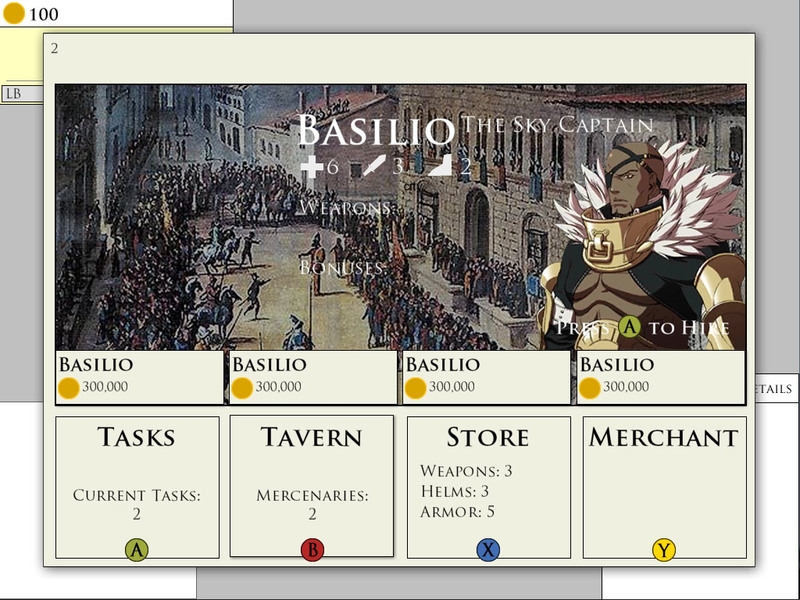 You can see the Merchant is also an option in the main UI, but I’m deciding whether that feature is needed at all. This weeks work completed the design and functionality of browsing Tasks, browsing Equipment, and browsing & hiring Mercenaries. Tasks need to be acceptable, and Equipment purchasable, but that utilizes much of the same logic as hiring Mercenaries so they should be quick tasks. The Squad UI is accessible from the Overworld and is the place to see your current recruits and interact with them; be it equipping items, learning their powers, or reading their lore. This is a pretty complex UI, particularly with Ventura‘s controller focus, so it was the longest task for my Sunday’s development time. A difficult UI design challenge is the limitation I have with regards to full screen UI. As the game is in real time, and your goal is to spend your limited time wisely, players can’t have their main view blocked by a UI. They can’t be stationary spending precious seconds reading Lore, Ability information, or calculating attributes. The Squad UI has a large amount of information in it, but it must be accessible without preventing the player’s travels on the Overworld. While I don’t have an ‘auto-run’ feature built yet, this Squad UI is designed with that in mind. It must be informative without preventing progress. Imagine riding from Venice to Milan, with one eye on the overworld map and the other spent analyzing how best to equip your team. This is a better situation than feeling awful for standing still while you tinker with your troops. Each character in your squad can be opened up to view their detailed information, while also enabling the equipping of items. 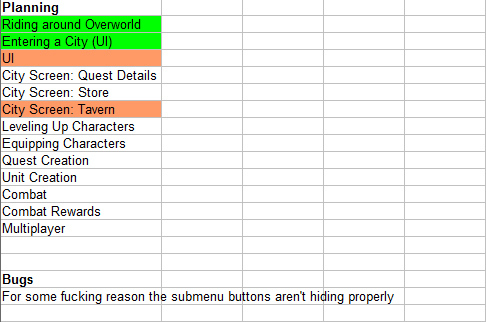 One great thing about building this feature is that it involved a ton of database work and planning that will assist with many other parts in the game. Building UI is such a rewarding design task because it solidifies the ideas you have in your head and makes them tangible; from here you can really assess if it’s working or if they need a rethink. 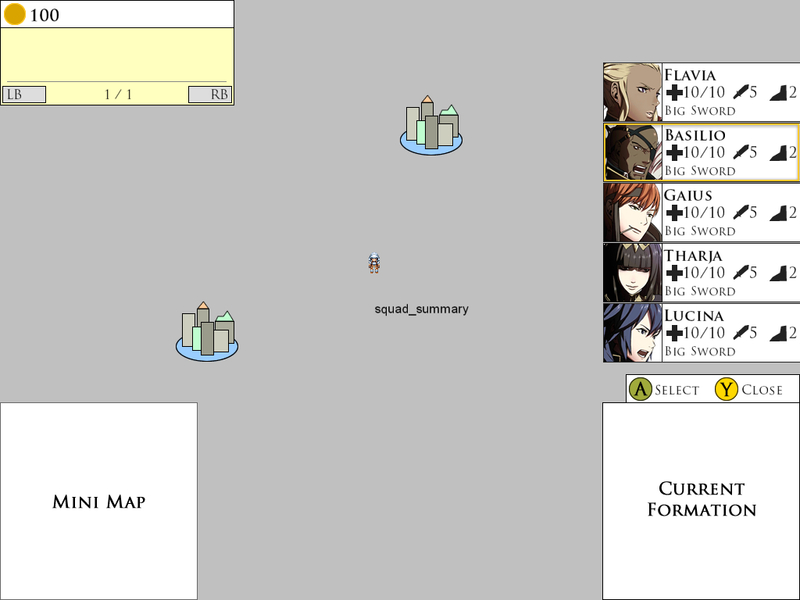 For example, in the Squad UI I’m forced to use the Left-Stick to navigate through menus. I really didn’t want to have to do this. I wanted to use Face Buttons for everything, which you can see from my City UI screen. Alas that is not possible here, so now I’ve realized I need to go back to the City UI and convert the Face Button design to the Left Stick navigation. Consistency is crucial in UI design. 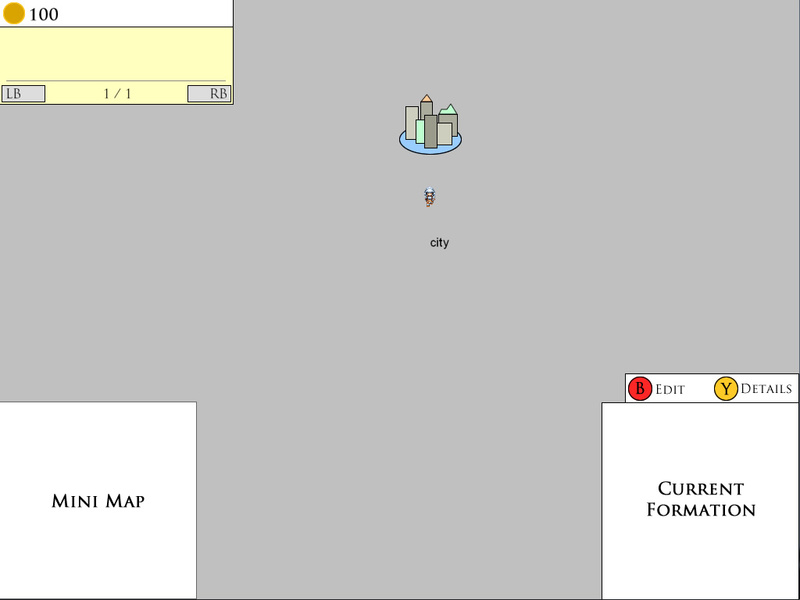 The other rewarding thing about UI is that it’s all about displaying information from your game. This sounds bloody obvious but here’s the lesson; In order to display the information, you need to access the information. Creating UI often involves the same logical links and information management that will be needed when the game systems are built. For examples, because my Unit Details UI can display Basilio’s modified Attack value, I can call the same variables and use the same processes to modify his Attack value in the Combat System. 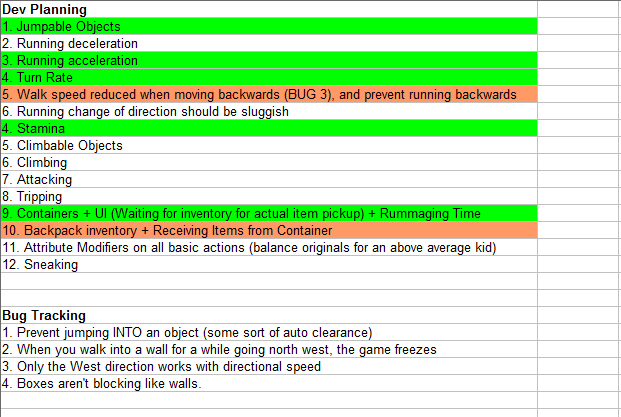 Therefore building a comprehensive UI is also building important parts of the Combat System! A game design is often like a block of marble that you need to chip away at until you’ve got the perfect product (if perfection is possible!). When Ventura sprung up in my head, it had a lot of features. While designing and building the game, I’ve realized that some features could probably be cut. The Merchant: Currently this is on the chopping block, but is not removed yet. It’s pending because it’s based on a more complex City system that involves reputation management. If the game is complicated enough without reputation management, then I don’t really need the Merchant. In fact, the Merchant feature (which would involve the trading of precious Goods to earn more money) feels a lot like a post-launch expansion feature. Helm/Armor: As you can see from the UI above, Units can equip a Weapon, Helm, and Armor. But why have 3 categories? If I want players fighting to obtain items, why would I triple the pool of items that are available? This is an economy issue and something that might be needed or might not. If Units can just equip a single item, that may or may not be enough depth to bring the game’s ‘competitive shopping’ to life. This is another feature on the chopping block, and it would save me a lot of time on balance and content creation. The deadline for PDJam occurred yesterday and there was no way Ventura was ready to be gamified. There isn’t even a combat system! Nonetheless, do check out the submissions and support this wonderful Jam idea. You’d never have thought my New Year’s Resolution was “stop making promises I can’t keep”… actually, you probably would because resolutions are made to be broken! This is a long-winded apology for not having a Ludum Dare post-mortem. But worry not, as plenty of stuff has been done. 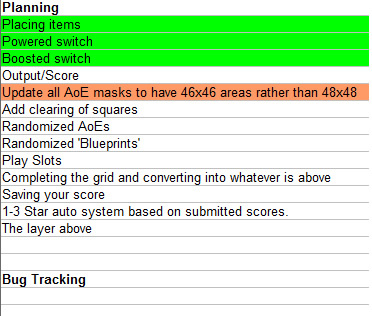 Project Grid Optimizer is pretty much done from a core mechanic standpoint. There’s plenty of room for growth, adding more variations and mechanical tweaks that absolutely explode the content (for free!). The core mechanic is there though, so it’s ready for The Playtest whenever I get around to packaging all these prototypes I’ve been building. 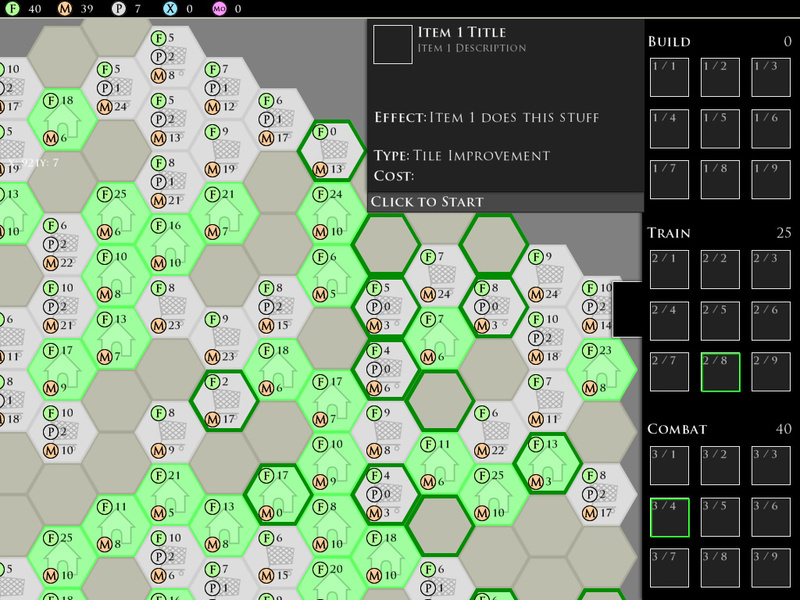 Last week, before I started Grid Optimizer, I mentioned that I was delaying my original Candidate 2; Post-Apocalyptic 4X. Grid Optimizer gave me some easy work so I could rest up and get my head back in the game, so now PA4X is knee deep in development! 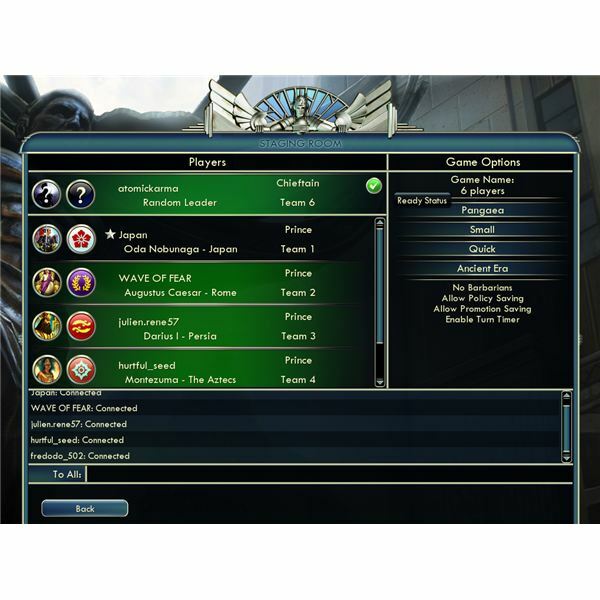 The whole project spawned from the frustrating situation that arises from trying to play Civilization V online. 4X games are wonderful, they’re almost a perfect genre for me as a strategy game fan. I wish they had good multiplayer, but there are so many problems with traditional 4X design that create an abrasive experience. I want to try and fix that. One of my favourite parts of Civilization is finding a location for a new settlement. It’s such a perfect mix of all the 4Xs. Exploit: You know how big your city will grow and what you need, you’re trying to find that perfect mix of hexes to place your city on to exploit the most benefits. Exterminate: While exploring and settling, you need to exterminate any threats along the way. Your city’s position can also be aggressive or defensive, determining whether you plan to exterminate or prevent extermination versus another player. The problem I find with Civilization is that this fun part of the game very quickly becomes redundant. The map fills up quickly, and every new city you found has less of a return than the last (ahh, the law of diminishing returns). It also majorly increases the turn time. 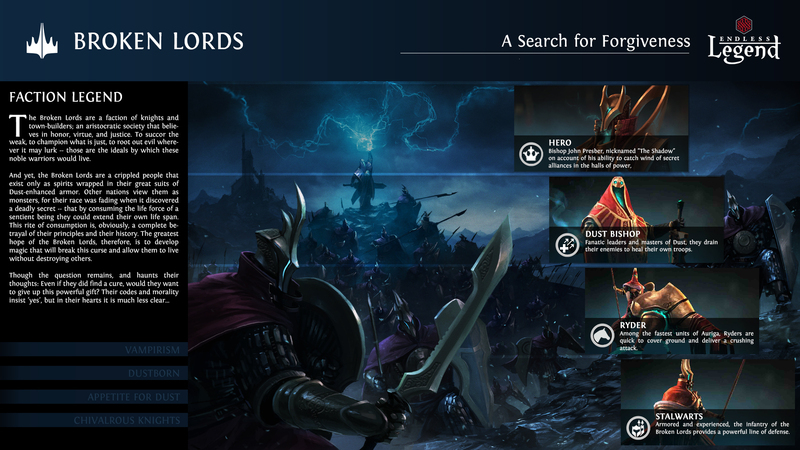 Endless Legend did a wonderful job building lore and introducing ideas like Quests into the 4X genre. However, Crusader Kings II is more the sort of thing I’m looking for. Not many 4X games tell the tale of your daily struggles, the personal management of your people, and the importance of collaborative teams of characters and not the ‘One Great Man’ emphasis. 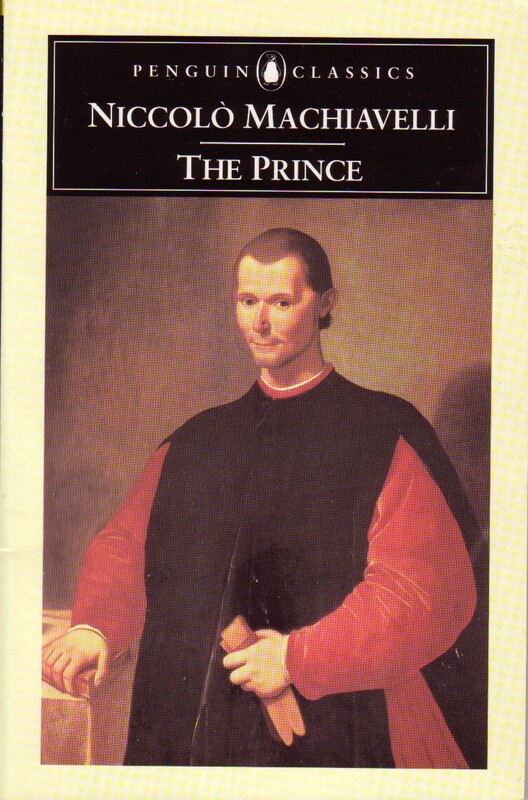 I want PA4X to be story-telling machine… developing on concepts like City States and Neutral Factions in Civ V/Endless Legend, using inspiration from Crusader Kings II to develop not only interesting stories but interesting characters that make every playthrough unique. 4X theming has been so focused on growing massive and crushing everything beneath your might, that I feel there’s room for a game in a more survival style. I want the world to feel brutal, not aspirational, I want the people to be struggling to rebuild what they once had, not aiming for the moon (literally). While PA4X is multiplayer focused, I want it to be a struggle just to survive the game, so that even if you’re left behind by your competition, you still have a sense of individual achievement if you can make it to the end. What I’m going for in PA4X is a sort of Civilization for a Walking Dead world. 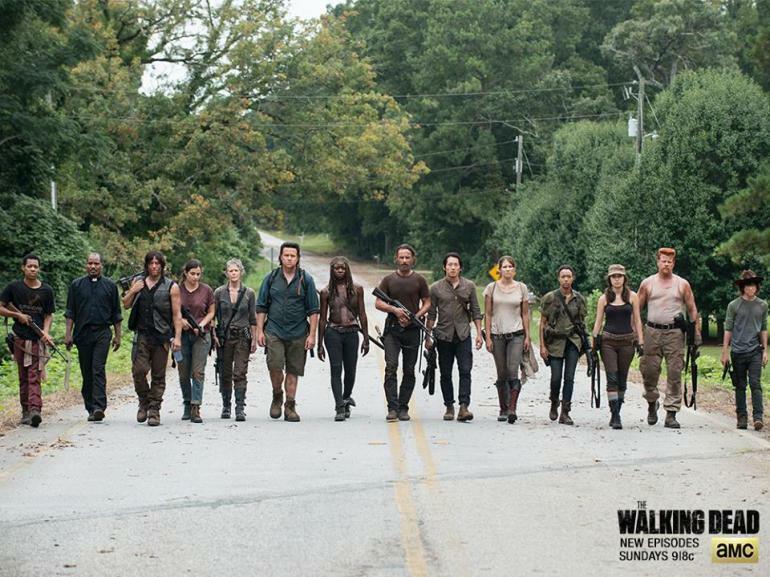 No zombies, because I’m sick of them, but similar struggles to lead disparate groups of traumatized people and survive in the horrible new world that has been left to them. I want players to become a Rick Grimes… or The Governor, both powerful leaders who use their own style and resources to build their version of ‘civilization’. So with all that said, how’s progress? 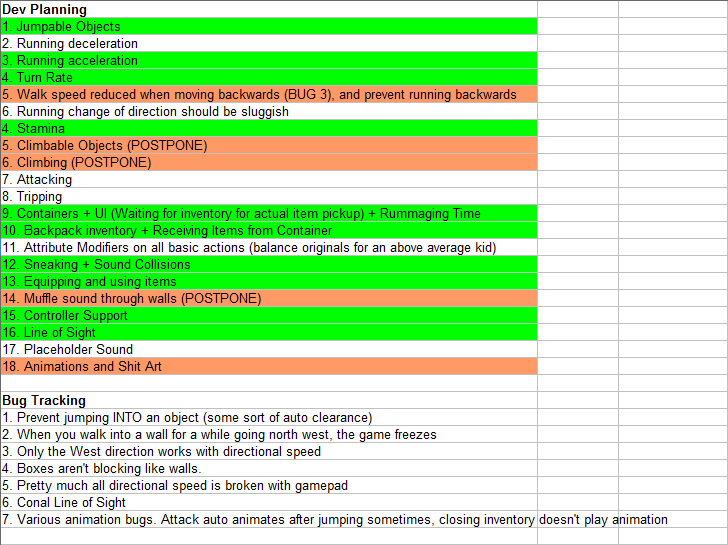 I won’t be GSDing PA4X because I’m trying to develop it in a 3 day burst and there’s no point in a day-to-day update. Day 1 was spent hooking up Grids by Gamelogic which automates an absolute ton of work that I’d otherwise have to learn and implement for the Hex grid system. I’ve got an extremely loose generation system working and a tiny amount of content to prove that the functions work. Day 2 felt much bigger although I’m not sure if I actually got more stuff in or not. It’s just nice to see it look more like a game and less a Match-3 puzzle! On Day 2 I hooked up a temporary ‘do everything’ UI that handles the unlocking, buying, and management of everything in your ‘city’. UI is always a big pain to implement in every project I’ve ever worked on, so I’m glad to have got this core functionality in. I’m actually still on Day 2, so depending on how I feel this evening I might even be able to get some more done! ‘Line of Sight’… I used a friend’s solution so I didn’t actually develop this! I do have to tweak it though, which I’m dreading. 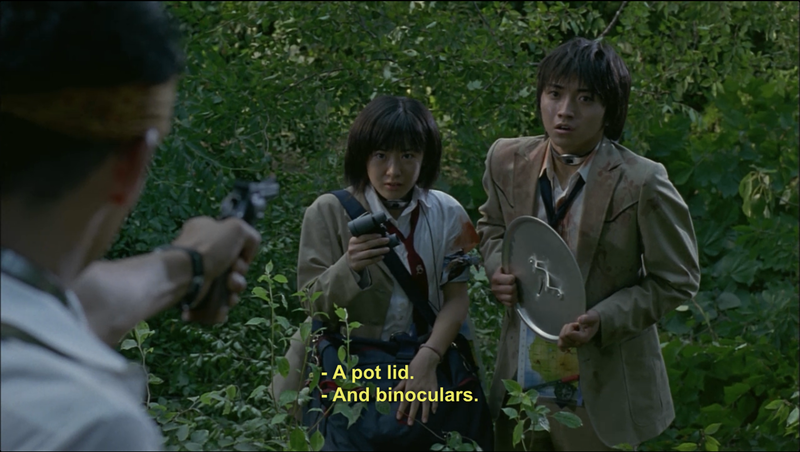 It was all a lot of fun to develop, and surprisingly easy. This seems to be my general thought with programming; it’s surprisingly easy. I’m sure when I start working on more nuanced and polished mechanics I’ll get to the hard stuff where I need things like… maths. This post is actually delayed by a few days and I’ve done so much more since then. I’ll get that update in before the final 2-week mark ‘post-mortem’ where I’m supposed to stop working and show people what I’ve done. 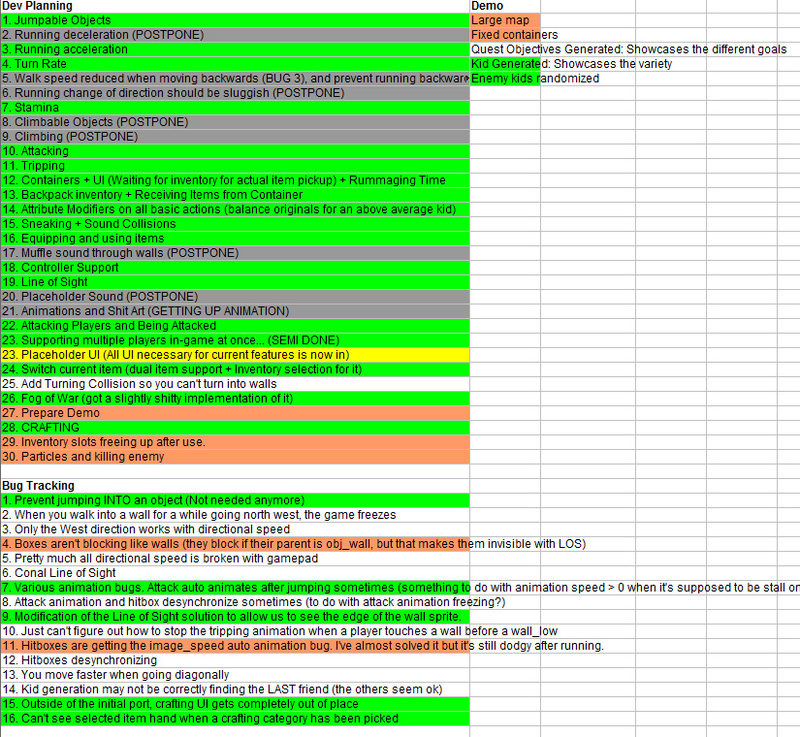 One major concern I have is that it isn’t a game yet, and it won’t be one by Sunday. Evaluating how ‘fun’ it is will be very difficult at this point. Perhaps for this first playtest, I will just watch silently as people interact with the character and the area… taking notes on control schemes and various issues they have. 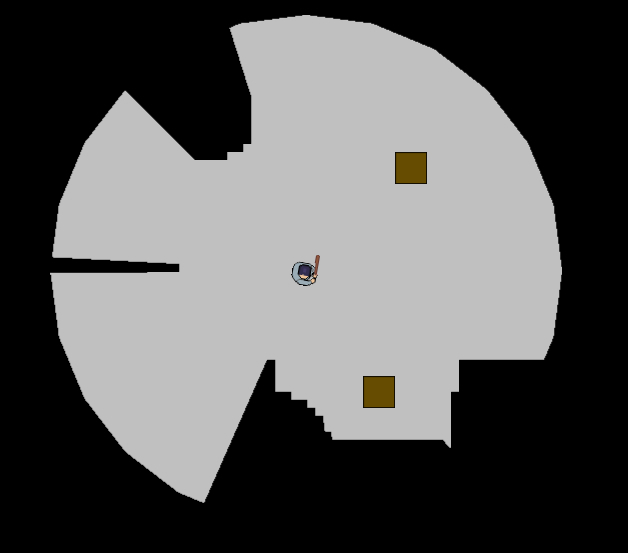 Another option is to create a quest for the players to achieve, which encourages them to interact with the area and perform many of the tasks that they would do in the ‘real game’. This is something The Stanley Parable did with its non-spoiler demo. The final option is to do the previous idea and also add in a little same-screen combat demo. Plenty of food for thought! I’m very aware that ‘finding the fun’ too late has been my number one weakness, so I’m hoping to avoid that again.